The case for support is the foundation of a successful fund-raising program, and must state in clear language what your institution intends to accomplish with the funds that will be raised. The most effective case is written from the perspective of the potential donor, to show him or her that financial support for your institution is consistent with personally held aspirations and community interests. Writing the case for support is best accomplished as a process of research, involvement, and cultivation. This process can be as productive as the document itself, and when managed properly it is a singular opportunity to involve influential community leaders in your plans C and perhaps the first step toward cultivating their philanthropic support. We have found that today’s successful funding initiatives require greater cultivation of major donors. Our Leadership Awareness Program is a structured approach to cultivating major gifts, and it has enabled our clients to initiate lasting relationships with donors. Our approach creates the appropriate structure required to enlist and mobilize your staff and volunteers to create and sustain the donor relationships required to develop major gifts. Today’s development office is blessed to have a vast array of third-party research vendors and services available, yet the offerings can be confounding, not to mention expensive and possibly unproductive if not employed correctly. 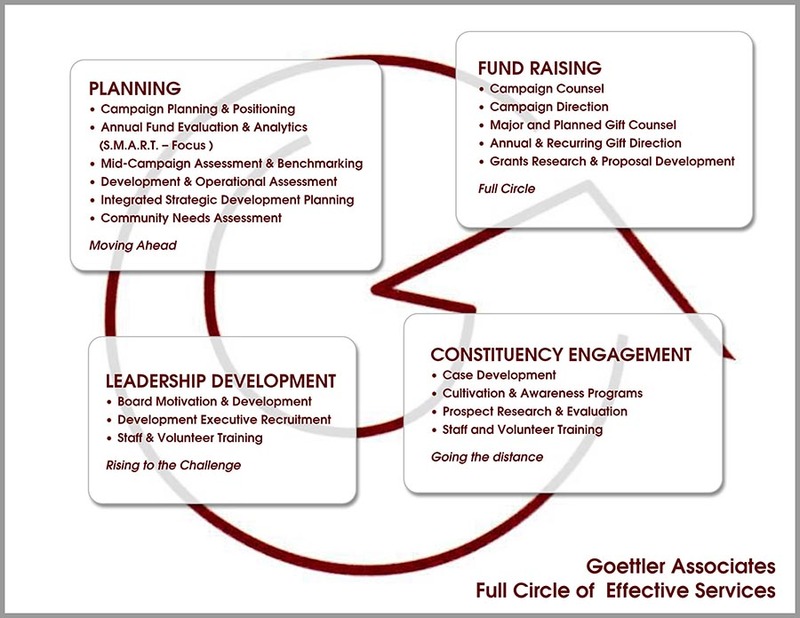 Goettler Associates helps institutions broaden their field of prospective donors. We bring the appropriate knowledge of the marketplace and extensive experience developing successful prospect research and evaluation strategies. We have partnered closely with many of the screening services, and know the tremendous benefit of these services and how to further leverage the data to actually produce the long-term results desired. Your organization=s professional staff, board members, and leadership volunteers are important partners in a successful development program or campaign. Carefully orchestrated coaching and training provides critical constituents with the skills and confidence they need to implement and carry out successful development initiatives. Donor stewardship is the key to establishing a growing base of support and a renewable source of funding. Transforming first time donors into passionate advocates and ambassadors requires specific planning and the implementation of defined and measurable donor-focused relationship building strategies. A myriad of new and emerging technologies offers development professionals new ways of developing broader constituencies. An assessment of internal capabilities and a clear focus on strategic objectives, coupled with our continuous interaction with the evolving marketplace of offerings will help your organization to define the most effective and affordable strategies. A major fund-raising campaign represents an exceptional marketing opportunity to reinforce your institution’s image, while creating a sense of urgency and excitement in the philanthropic community. At Goettler Associates, we believe that every campaign should be supported by a professionally produced package of communication materials that build the confidence of campaign staff and volunteers and reflects the values of the institution. Writing, Print Design, and Video Production. The firm maintains long-standing relationships with a team of trusted writers, designers, video producers, and communication professionals who have worked with our clients to create campaign communications that are grounded on proven marketing techniques. Their work on behalf of Goettler Associates’ clients has been recognized with awards from CASE, AAM, ITVA, PRSA, IABC, and other professional societies. 50 years is a wonderful achievement. It is my pleasure to work with Goettler Associates on two campaigns over the past 18 years. Goettler has been a tremendous help in supporting us to achieve our goals. It would not have been possible without your guidance, encouragement, and knowledge.